This is the second of two posts dedicated to the Carole Lombard: The Profane Angel Blogathon being held over at In The Good Old Days of Hollywood. Tnx Crystal for letting me take part! Brief Synopsis – A lawyer gets married on a whim after bumping into a woman while on a business trip but little did they know how married life would affect their lives. My Take on it – I chose this film for this blogathon because despite never really knowing much about Lombard’s roles, I’ve always been a fan of Jimmy Stewart’s and hoped that this would be an entertaining film to watch. Unfortunately, it ultimately feels quite average and generic on all that it tries to do. Stewart and Lombard are fine together but they don’t necessarily have amazing chemistry together because something just feels a bit off between the two of them. This film has a bit too much melodrama that isn’t really necessary which brings things down a bit. The reason for the melodrama is to try and raise the pace and impact of the story, but it just doesn’t work as well as it should because scenes that should be taken really seriously seem too comical and strange. Bottom Line – Stewart and Lombard are good together, but something still feels missing here. The story is quite average and doesn’t really pick up despite for efforts of the script. I think Carole showed how good she was in drama here, but I agree that the film has too much melodrama. Especially in the end, geez! Thanks for taking part in the blogathon, but I must apologize for the late reply. I’ve just returned to blogging after a long hiatus due to the death of my aunty on New Years Eve, which left me emotionally scarred. 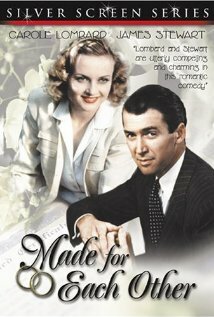 “Made For Each Other” is a great showcase for Carole’s ability as a dramatic actress, and she proved that she was just as adept in this sort of role as she was in screwball comedies. Thanks again for this great review. On my return to blogging, I announced a new blogathon, and you are cordially invited to participate. The link is below with more details.